I started with a 5x5 "Craft" cardstock base for the card. 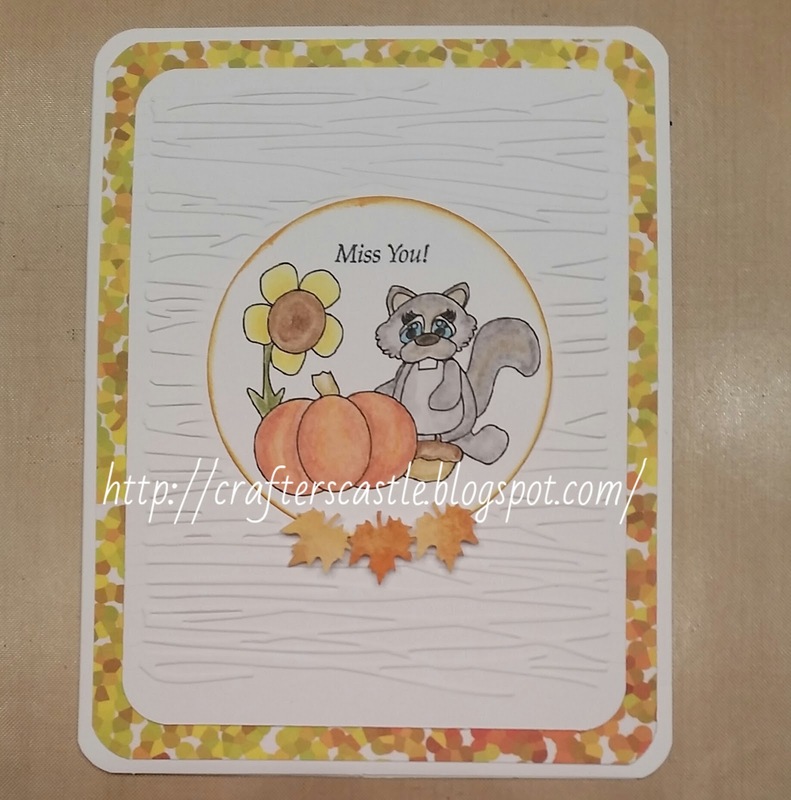 The next layer is a creamy beige piece of cardstock that I embossed with my Cuttlebug and a Darice embossing folder "Fall Leaves Swirl". 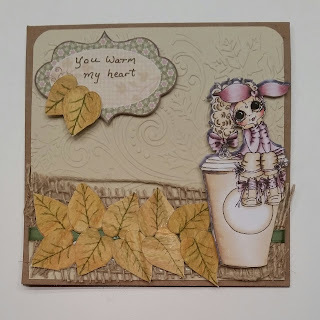 I thought that embossing folder was perfect for this.....not only does it give the look of a blustery Fall day, but the swirls made me think of steam coming of the cup of hot coffee (or hot cocoa, or hot apple cider....whatever it is you're in the mood for). I glued a piece of burlap across the bottom, and then a piece of green ribbon over that. Next I topped it with leaves I made using a technique I saw on a Scrapbook Blessings Club blog hop....Everything Fall Blog Hop - Day 3 ....you can see the tutorial there. But here is a quick explanation.....I took watercolor paper and radomly scribbled Distress Markers around it...I used Peeled Paint, Forest Moss, Wild Honey, and Spiced Marmalade. Then I used a waterbrush (you can use a paint brush and water) and blended the colors....not into one color but a collage of color. Next I used a small Sizzix Flower die to cut flowers. Then cut into individual petals. I used the Peeled Paint Distress to draw the spine and viens on each petal to make it look like a leaf. Mine aren't exactly like in the tutorial....I didn't have the same flower punch that she used, and I made my leaves the opposite direction. 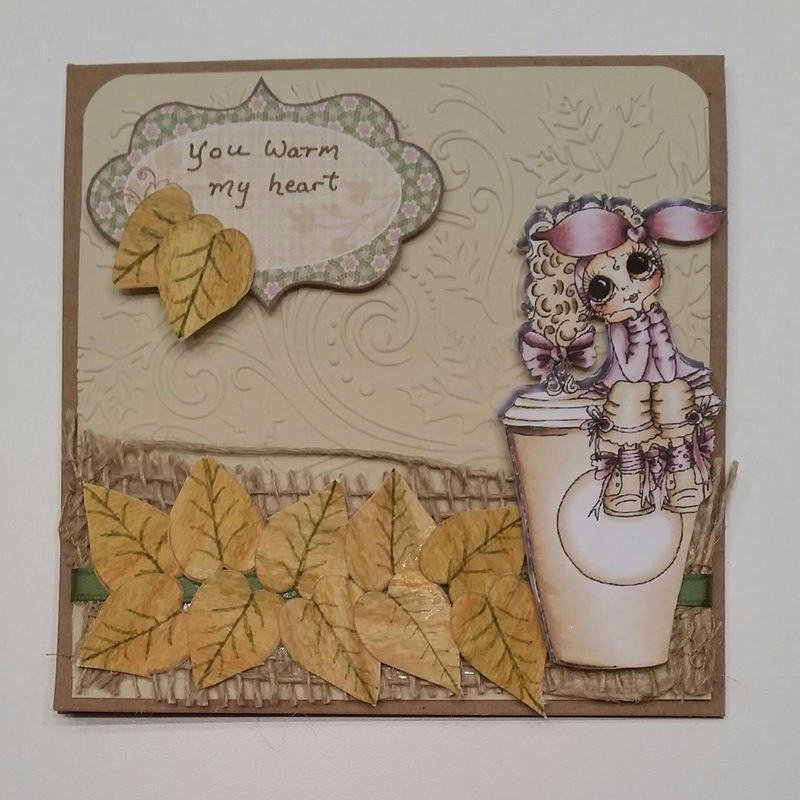 But the inspiration was there :) And the final touch is that adorable image from a Sherri Baldy colored printable sheet Coffee Bestie . Oh and I rounded the top corners to soften the look. This is a cutting file that includes SVG, PDF, PNG, JPEG, EPS and DXF and works great with machines like Cricut Explore, Cameo, and Silhouette, or can easily be cut by hand. Or you can just print it out like a pre-colored digi stamp and not cut it. Anyone that knows me knows there are two things I really like.....images that I can print and cut using my Cricut Explore, and images t that I can make dimensional. So I used my Cricut Explore to print and cut this twice. 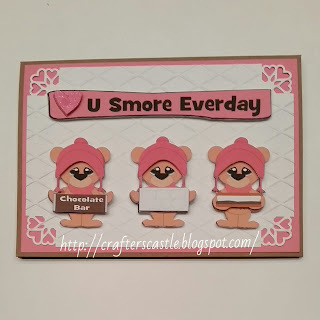 I used the second set to cut out the hats, chocolate bar, tray of marshmellows, and s'more and used dimensional foam tape to attach them to the other set of iimages creating the dimensioal look. I also cut the heart the extra heart from the sign and heat embossed it with embossing powder giving it a sparkly glossy look and used dimensional foam tape to attach it over the heart on the sign. The white background was embossed using a Cuttlebug embossing folder from the "Wedding Suite" set. Then I used a Martha Stewart corner punch with hearts...sorry I don't have the name of it. 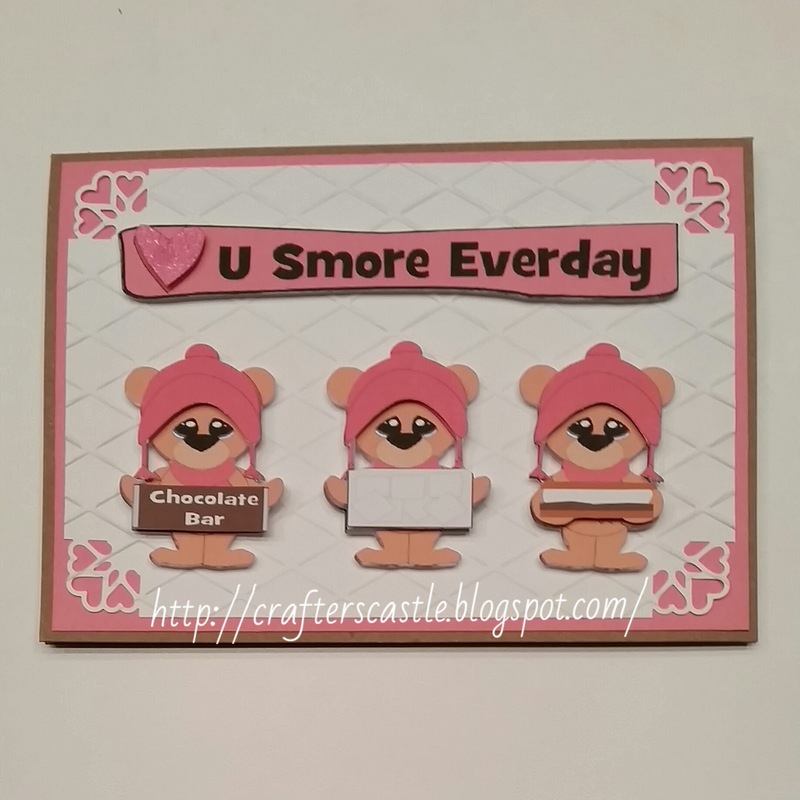 I layered that on top of pink cardstock, and used a craft paper card as the base. The first thing I needed was a stamp that would work for this, perferrably a flower....I decided that this "Blooming Graden" stamp set by Penny Black had the best flower to use. Other supplies I used are craft paper (the brown natural craft cardstock) white Ranger super fine embossing powder, Ranger Inkssentials Emboss It clear embossing ink pad, CTMH "White Daisy" ink pad, Distress Ink and/or Distress Markers, a heat gun, a fine paint brush (or water brush), and water....and until I make my own YouTube video on this technique I will give you the link to the one I watched...click HERE to see the video for instructions. I would give directions here on my blog but I think it is easier and clearer to watch the video. Feel free to ask me if you have any questions. Other added touches.....I used a Martha Stewart corner punch (don't have the name), ribbon, and pearls. 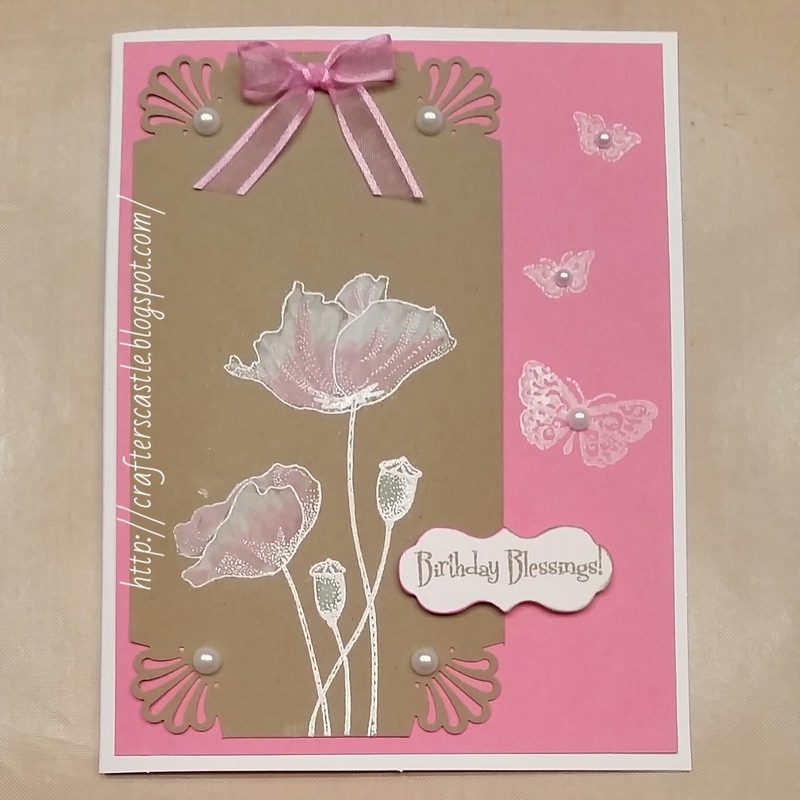 I used the CTMH "White Daisy" ink pad to stamp the butterflies which are from the "Butterflies" stamp set by Hot Off The Press. The label is die from the Paper Artist cutting dies set "9Tiny Tags & Little Labels" also by Hot Off The Press. The sentiment is is from MSE! "Birthday" stamp set. I inked half of the label in "Picked Raspberry" and half in "Frayed Burlap", and stamped the sentiment in "Frayed Burlap"
This is such an elegant technique, I hope you try it! I layered a piece of paper from Cricut's "Tags, Bags, Boxes, and More" paper stack on top of the white card. Then I embossed a piece of white cardstock with a Cuttlebug folder along with a Sizzix embossing diffuser which left an unembossed circle for me to place the image in, and layered that on top. 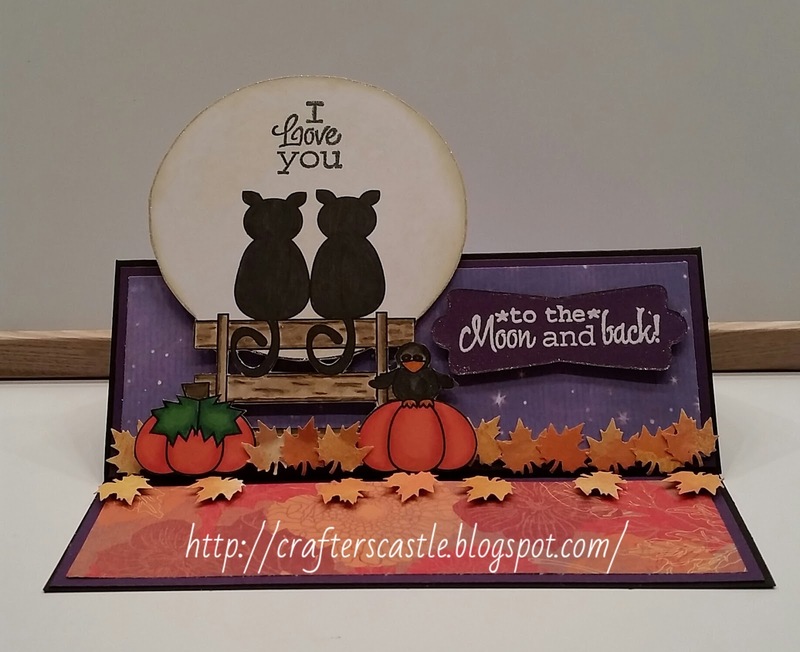 After stamping the image I used a Sizzix circle die to cut around the image. Then I inked the edges of the circle with "Wild Honey" Distress Ink. Since I colored the last two cards with Spectrum Noir alcohol ink markers I decided to color this one with watercolor pencils. 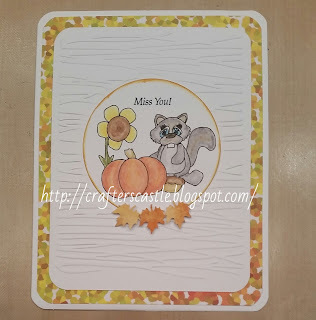 I stamped the sentiment "Miss You" with a CTMH stamp from their "Just To Say" collection. I added a few leaves to the bottom of the circle for an added Fall touch. 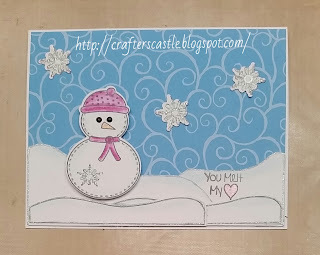 This card was simple and quick to make, but looks very nice. 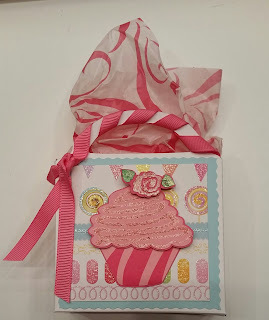 I LOVE these stamp and die bundles....you get the cutest stamps and matching dies which makes creating so easy. Just for example, the Holly Days bundle has 7 stamps and 7 matching dies, and Thanks Snow Much has more!!! I used chalk to add shading on the snow and snowman and outlined everything with glittler gel pens. I used watercolor pencils on the snowmans hat & scarf. And his eyes of "coal" are Imaginisce i-rock Rhinestuds. 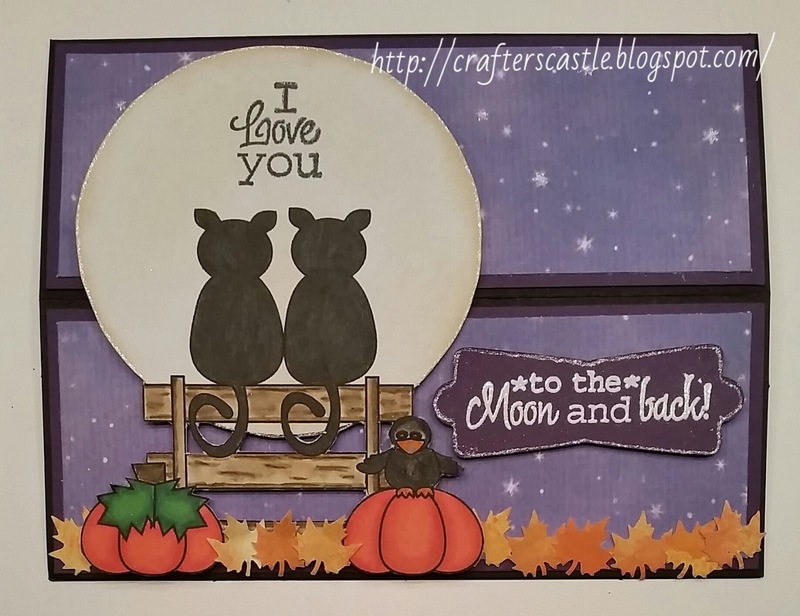 I have made a video tutorial on making this card but it won't be out until October 8th. This is another Thank You card I made. This one my husband gave to a friend. 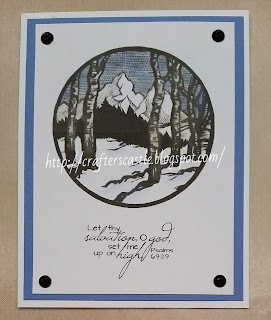 I truly LOVE the images and scriptures that Mynn has at her Etsy store MHK Designs ...this one is from her Lift Me Higher digital stamp set. It's gorgeous and perfect for either a man or woman. That verse is part of the digital stamp set and I thought it was perfect to go with that image. 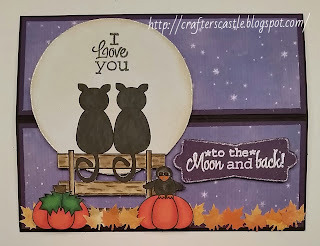 I gave the image a hint of color by using Pebbles Pearlescent Chalks. 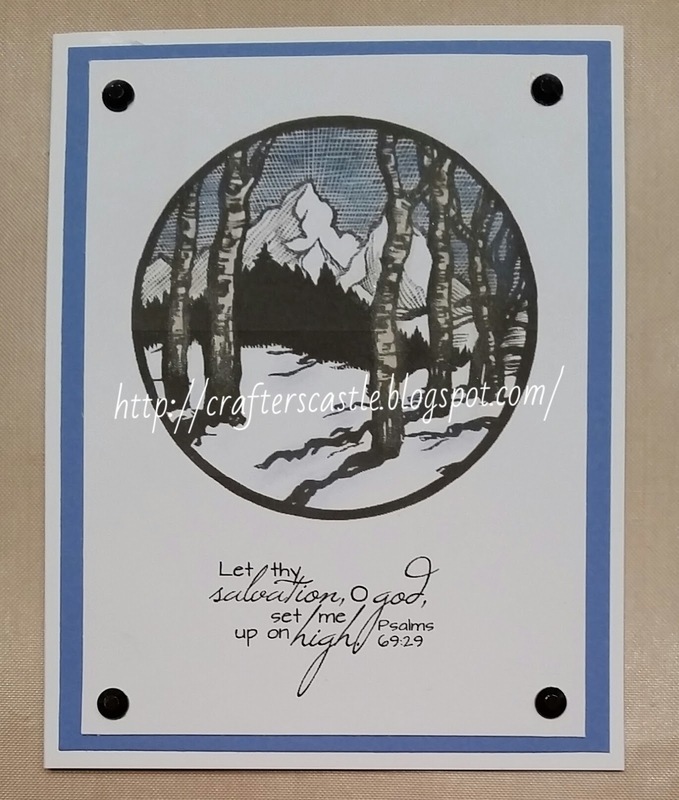 I layered it on a blue cardstock that would bring out the blue of the sky. And since it was for a man, I added the shiny black gemlike studs in the corners to give a little extra something. I have been having fun using svg files. I had no idea what they were until a few weeks ago....but when I found out they were cut files for machines like the Cricut Explore (the one I have) or others like the Cameo or Silhouette, I decided to give it a try. They are awesome!!! I used two of Sherri Baldy's svg files to make this sweet gift bag. I used the Bestie Bag svg file and the Cupcake svg file. You can get them at her My Besties Shop, and once you buy the file it is yours to keep and use over and over again. 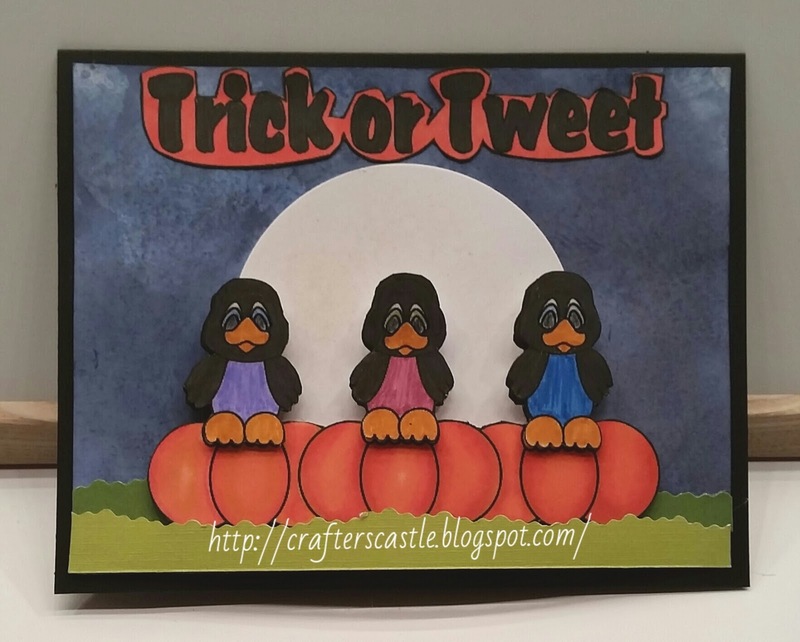 With one piece of 12x12 cardstock you can cut 2 bags,,,,,or you can make one a little bigger and one a little smaller. You decided the size. It even comes with a cut file for the panels if you want to use it. But on this one I cut my own panels because I wanted a scalloped edge. The dimensions of the gift bag shown above are 4" wide x 3 7/8" high (or 4 7/8" high if you count the handles) x 1 3/8" deep. It's the perfect size for a necklace, or bracelet, or gift card, or any small gift. You can make it whatever size your machine will allow. On the cupcake I added some Stickles to make it look like swirly frosting, and I used Sakura Stardust Jelly Roll pens on the flower to give it some sparkle. The fun cardstock I used is from a DCWV 4"x6" stack but I don't know the name because the cover is missing (oops). I thought wrapping ribbons around the handles and tie them off on the side would look cute. If you have a personal cutting machine like a Cricut Explore or Silhouette you should try this and other svg's. It's nice to not have to buy a cartridge, instead just buy the images you want. 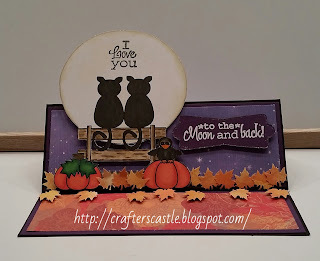 About this card...I created the background by smearing my "Chipped Sapphire" Distress Ink pad on my craft mat and spritzed it with water. Then I layed a piece of white cardstock on it and pushed it around smearing the ink onto the cardstock. I thought it made a perfect night sky. I cut a big circle for the moon and used a sponge with big holes to apply "Antique Linen" Distress ink radomly. For the grass I used jagged edged scissors to cut two strips of green cardstock....one darker for the back, one lighter for the front. I cut out the entire image and used dimensional adhesive squares to pop the pumpkins up over the back layer of grass and then curved the front layer of grass to make it look like the pumpkins are behind it. Now for the fun stuff...the image. I colored the pumpkins with Spectrum Noir GB7, OR2, and OR3. I colored the black birds with Tim Holtz Distress Markers..."Black Soot" for the feathers, and "Spiced Marmalade" for the beaks and feet. I colored the bellies as if they were wearing shirts and used each of our favorite colors. I used watercolor pencils and Sakura Jelly Roll Glaze for the eyes. 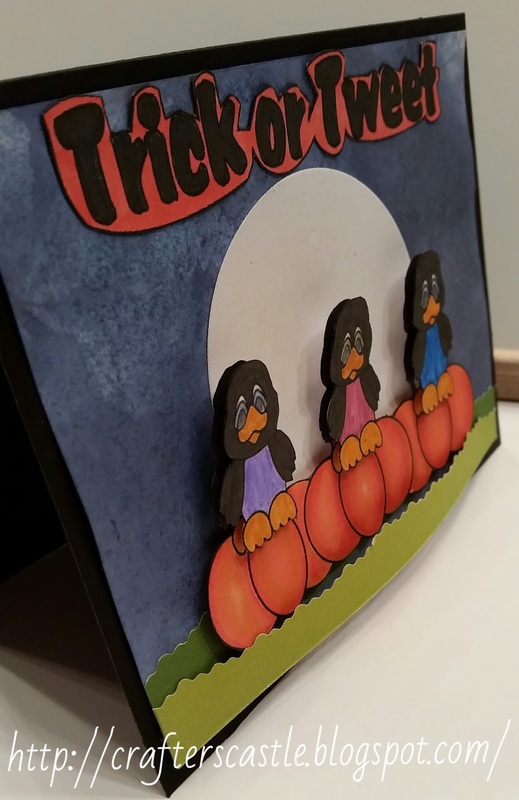 I also cut out and colored additional black birds so I could layer them giving them a dimensional look....as you can see in the side view in the bottom picture.